The Knights of Pythias introduced three new members during their meeting on Wednesday night in Wallaceburg. The new members are Brandon Mitchell, Jeff Taylor and Jason Mallette. Chancellor Commander Jerry Blake and Grand Chancellor Commander Doug McCallum were on hand for the induction. The Wallaceburg service group is always looking for new members. 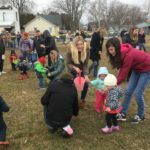 The group focuses on many programs geared toward youth, including the organizing of the annual Santa Claus Parade and Easter Egg Hunt. The group also supports Special Olympics and recently launched a reading program at Wallaceburg Christian School. More details, here. Anyone wanting to join can message the Knights of Pythias Facebook page or contact any member.